No more fake news, myths or hearsay. Just plain old honest real information on what works, what ADHD really is and what it isn’t! If so…this is exactly what happens during the Succeed with ADHD Telesummit… and you’re invited! How it works: Each day you get access to 5, 30 minute expert speaker audios and you have 24 hours to listen in to them for f.r.e.e. The next day you will be sent the link to 5 more different topics and speakers and so on. What you also get: Just for signing up you get our ADHD S.W.A.T. (Succeed with ADHD Telesummit) Swag Bag with goodie bonuses from the telesummit sponsors – Dr. Kari Miller and me. Learn how July 23-27, 2018. Sign up today here! P.S. 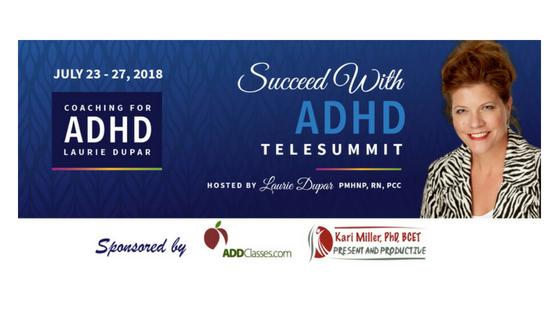 It’s easy to learn how to thrive with ADHD the 8th annual Succeed with ADHD Telesummit – sign up here.